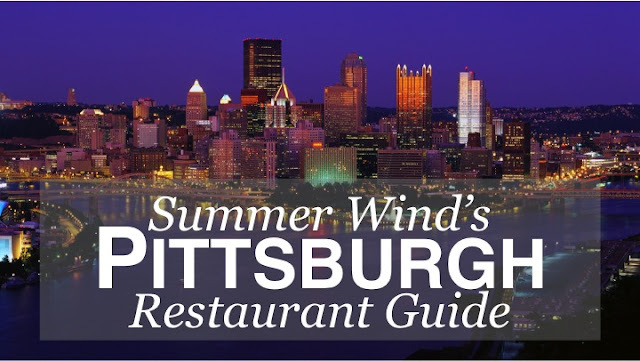 I love to highlight Pittsburgh's best and my personal favorites. I've shared a bunch of various posts over the years that shares bits and pieces of what life is like in Pittsburgh. I get a lot of e-mails from Summer Wind readers who are visiting or moving and always looking for good recommendations, so I thought this would be a great resource to share with everyone! The Commoner- The brussels sprouts are to die for. Great place for happy hour and weekday breakfast. Their croissant with egg and cheese is the best breakfast sandwich I've ever had. Reservations recommended. Their bar is very small. Butcher and the Rye- Trendy/Eclectic atmosphere, unique cocktails and another great place for brussels sprouts. Their steak tartare and bone marrow make it worth the visit. Andy's Bar- Located in the Fairmont, champagne by the glass and delicious burgers and salads. Great for happy hour, but also great for cocktails in the evening with their live jazz trio. Six Penn Kitchen- Their food is OK, but the rooftop is worth it just for a drink! The Duquesne Club- A Pittsburgh institution. Go for their spots and macarons (bonus points if they are chocolate dipped). SO good. Il Tetto- Not for food, but a great, lively rooftop bar. Sonoma- Extensive wine list and full bar in a pretty atmosphere. I always get their ginger salmon. Eddie Merlot's- Go for their extensive wine list and oysters which are out of this world as is the beef carpaccio. Their back patio is adorable. Sienna Sulla Piazza- Handcrafted Moscow mules, prosciutto and arugula pizza and the most amazing burrata ever. Great for lunch and dinner with seasonal outdoor seating. Bluebird Kitchen- Their Cuban is amazing as well as their various salad offerings. Great for lunch for those who work downtown. Terrace room (my review here)- Located in the William Penn. Old school glamor, delicious food. Prices are very reasonable for the grand/elegant atmosphere and top notch service. Head to their speakeasy after dinner and get the Pimm's Cup. Istanbul Grill- Lunch on weekdays only, located in the basement of the Steel Tower, this is incredible Mediterranean/Middle Eastern food. I love their cabbage, chickpeas, hummus, salad, chicken pita. Basically, everything they have is amazing and if you haven't eaten here, you are missing out. Cash only. Las Velas- Spicy margaritas and delicious casual Mexican. Also very inexpensive! I always get the fajita salad. Poros- Located in Market Square, this Meditteranean restaurant with heavy Greek influence is good and the atmosphere is even better. Would be great for a celebration or date night. Tako- The guacamole with tuna (trust me on this) is the best thing I've ever had. The queso fundido is also the best queso I've ever had and same with the Korean tacos. Drinks are good, too. Make a reservation several weeks in advance. Great for date night. Casual dress. Definitely my favorite restaurant in Pittsburgh. Bakersfield- Right on Penn, several levels with large bar areas. Great for happy hour-- tacos are good, but not the best. Margaritas are great, though, as is the guac! Thursday/Friday/Saturday nights, it gets packed, so hop on No Wait to get in. Market Street Grocery- Features Gaby et Jules macarons and La Colombe coffee. Also has a small grocery selection, a wine bar, and great takeout lunch options--- their chicken salad is excellent! Seviche- The atmosphere is tired, but the food makes it worth the visit. Get the tuna tartar. Meat and Potatoes- Definitely worth the hype. Extensive and unique cocktail list (great for happy hour). Get the fried pickles and the fried brussels. Pork and Beans- Make reservations at least a week in advance, but worth it. Amazing meats, mac 'n cheese, and more. A fun, casual bar atmosphere with great cocktails, too. Read full review here. Bill's Burgers- In the Westin's lobby, the space is massive and so is the menu. The burgers are worth the trip (super casual and inexpensive). Social House 7- My favorite restaurant within the AMPD group. The rock shrimp is delicious and the atmosphere is fun and trendy. Great place for cocktails (the Szechuan buzz is my fave!). Condado- Really inexpensive Mexican street food. The beef brisket or the pulled pork taco is my favorite. They also have a great happy hour special. Their spicy margaritas are delicious! Union Standard- The food is good but a little overpriced for what you get. The bar is great with an extensive and unique cocktail list. I recommend it for happy hour for drinks and oysters! Fl. 2- This is located in the Fairmont Hotel. It boasts a swanky, well-appointed cocktail bar with an impressive craft cocktail list. The decor is midcentury modern that boasts major Mad Men vibes. Delicious, interesting food (albeit, a bit overpriced) presented beautifully. Would be great just to stop in for a cocktail and take in the atmosphere. Great for a first date. Or, The Whale- A nautical-inspired restaurant with decor that makes you feel like you are on a boat! Located in the Distrikt Hotel, the scene is swanky and cozy. There is a separate lounge/bar area to enjoy wine or cocktails. Great for a date night! The food is upscale seafood and casual American fare. Eddie V's- Upscale steakhouse. A swanky atmosphere great for a romantic night or celebration. The bar is gorgeous and offers live jazz certain nights of the week. Great spot to get dressed up and have a night out! The Warren- This spot is a small little bar that's easily missed if you are not paying attention. Lots of great casual American food but also a sushi list! Craft cocktails and staple wines and beer. Quirky casual decor that nods to old school games like checkers! La Gourmandine- French baguettes and croissants that are to die for. Get there early. Arsenal Lanes- It's a bowling alley with live music and a full bar. It's so much fun! Arsenal Cider House- off the beaten path, a converted house turned into a really cool bar. You can taste all of their ciders before you settle on a growler. Pack a picnic and sit outside. Only downside? It closes at 8pm. Industry Public House- Amazing bar selection. If you like whiskey/bourbon, this place is for you. Standard bar/pub style menu, but more upscale presentation. Portions are huge (and delicious)! They also have Arsenal cider on tap! Tender- Situated on a corner right on Butler Street, Tender's home is in an old bank. It's a great place for cocktails and light bites, but also wonderful for dinner, too. They have a lounge area as well as a dining room (hidden in the back) and a private room downstairs. Smoke- Easy to miss the entrance right on Butler Street. Casual, urban hipster vibe. The tacos, margaritas, and queso were all very good. Cash only. No reservations, but there is usually a wait, so call ahead about an hour or two before you go. Umami- A unique experience and unique atmosphere. You have to be adventurous and willing to try things! My favorite dish was the okonomiyaki (it's a cabbage pancake). Cure- One of the best in Pittsburgh. They have a cute and cozy atmosphere, great cocktail/wine list and the charcuterie platter is amazing. Their dishes are unique and delicious, too. Driftwood Oven- The cutest little BYOB pizza restaurant. Their dough is actually sourdough- and it is SO delicious. Morcilla- Cozy Spanish restaurant. Great bar atmosphere but also great for a nice date night. The menu is unique and unexpected. Poulet Bleu- A beautiful French restaurant that will have Francophiles, foodies and interior designers drooling with delight. The interiors are straight out of a Nancy Meyers movie, the food is fabulous, a great wine list and full cocktail bar. Also adorable outdoor seating available. Pricey, but worth it and great for celebratory occasions or a romantic date. Franktuary- Incredibly delicious hot dogs with any topping imaginable. Casual and quick, but so worth a visit. Whitfield- Located inside of the Ace Hotel. Read my full review here. Excellent food, drinks, coffee, etc. The atmosphere is hip and trendy but laid back. Great for family dinner, girls night and date night. The perfect place to meet for drinks or coffee, too! Casbah- Best brunch in Pittsburgh (valet parking). Soba- Best Martinis in Pittsburgh. Great pad thai, but their Crispy tofu is to die for. Valet parking. Girasole- A favorite in all of Pittsburgh. Their seasonal squid ink lobster pasta is incredible. The atmosphere is loud but adorable, outdoor seating weather permitting, cozy and romantic and their ravioli are pillows of heaven. BOYB, but they also serve wine. BRGR- All of their burgers are amazing, and a fun atmosphere and large bar (even their salads are good). Noodlehead- Cool/casual atmosphere with amazing pad see ew...best part? BYOB. No reservations, so be prepared to wait. Tessaro's- Best burger in Pittsburgh. Avenue B.- I've never had a bad meal here. Small, so be sure to make a reservation. Menu changes frequently. The Livermore- Located in East Liberty, a cute bar with craft cocktails. A very limited food menu, so don't go hungry! Paris 66- This will make you feel as though you've been transported to Paris. Get dessert and cappuccinos. Prantl's- Burnt Almond Torte, need I say more? Also located downtown in Market Square. The Frick- Great brunch. Make sure to make a reservation! Plum- great Chinese food and sushi in a trendy atmosphere. Harris Grill- On Ellsworth-- an extensive menu but my favorite is the build your own bowl section. Pretty inexpensive and very casual. Great for getting together with friends or weekend brunch! Station- Very limited menu, but the food is delicious. The atmosphere definitely has a hipster/laid back vibe. Craft cocktails are also worth ordering. The burger was pricey for Pittsburgh standards but incredible. Lot 17-Cozy casual bar with more 'upscale', but typical (delicious) bar food. Great spot for Steeler Sunday. Church Breworks- The food is decent, but it's the novelty of being in an old church turned brewery. A fun, casual spot to bring out of town guests. Fireside Public House- Located in a somewhat hidden spot behind the Target in East Liberty, Fireside offers incredible wings and other casual bar-style food with interesting twists. The cocktails have quirky names and are creative! Penn Ave Fish Co.- Very casual, their lobster bisque is out of this world. La Prima Espresso- My favorite coffee and espresso in the entire world. Bella Notte- Casual, unassuming, but the best buffalo chicken pizza ever. Primanti's- The original. You can't say you've been to Pittsburgh without coming here. Peppi's- A hole in the wall hoagie shop. SO delicious, so messy. Eleven- Their prixe fixe brunch is amazing (similar to Casbah). Their basket of rolls is a must. The atmosphere is trendy and upscale. They offer an extensive wine list. DeLuca's- An iconic Pittsburgh institution. It's a hole-in-the-wall diner with the greasiest, but most delicious breakfast. Be prepared to wait. Smallman Galley- Industrial atmosphere, unique restaurant incubator concept, delicious food. Read full review here. Cafe Raymond- I stumbled upon this when DeLuca's and Pamela's was too crowded. Great breakfast options in a cute little setting! Gaucho- There is a very good reason why the line is always out the door. The food is absolutely incredible. So much flavor. You can BYOB and takeout, the atmosphere is very casual. Their empanadas are amazing, all the meat is wonderful and the sweet potato is SO good. DiAnoia's- Italian deliciousness. Homemade pasta, pizzas, meats, and more. Definitely a cute spot for breakfast and lunch, but a great spot for a date night dinner or big group! Read full review here. Lidia's- It's an amazing Italian restaurant with a fun, funky vibe. Get the pasta trio, you won't regret it! The Le Mont- The food is good, but not worth the price. Go to the bar for delicious martinis, live band during happy hour and stunning views of the city from their floor-to-ceiling windows. Great place to take visitors to for drinks! Monterey Bay- They recently underwent an extensive renovation. Best view of the entire city. Go to their lounge for drinks. Valet parking. Alla Famiglia- In a very sketchy part of town (if you are a woman, I wouldn't get out of your car alone in this area), but amazing Italian food. Their meatballs are incredible. You almost have to make a reservation, or you are SOL. La Tavola- Make a reservation. The atmosphere is very bare-bones, but the food is incredible. A great place for a large party. My recommendation is to order a ton and pass around. BYOB. Sadly, no view. Altius- Arguably the best restaurant on Mt. Washington. Very upscale, and romantic with stunning views of the city. I recommend a reservation. Great for special occasions. Dave and Andy's- The best ice cream, get their homemade waffle cone. Cash only. Hello Bistro- Custom Salads with about a million toppings. Locations also downtown and Southside. The Porch- great for sitting outside and people watching, on Pitt's campus, located right across the street from Cathy. Fuel and Fuddle- On a side street off of Forbes, amazing bar food. Get the steak phat wrap. The O- An Iconic Pittsburgh Institution. Slightly sketchy, a can't-miss-it hole-in-the-wall. A mountain of french fries that easily serves 4, a coke and hot dog should be your meal of choice. If you need to go to the bathroom... hold it. You've been warned. LuLu's Noodles- Quick and casual, but delicious noodles. I like to go here after visiting the museums! Legume- Beautiful, simple atmosphere which fresh, incredible food (food had a very subtle French flair). Menu changes often, make a reservation in advance. Dish- Incredible Italian food. Cozy and romantic. Acacia- A really cool speakeasy, right on Carson Street. Keep your eyes peeled, it's hard to find! Urban Tap- Fun atmosphere for Steeler Sunday, great for brunch. Large, open concept. Piper's Pub- A guy's favorite, lots of beers, traditional pub atmosphere and amazing corned beef and cabbage. The Grand Concourse- Needs a renovation, but gorgeous and historical, nonetheless. Somewhat fancy. Gandy Dancer is their bar and has a great atmosphere and pianist. Sunday brunch is one of the best in the city. Come very, very hungry and make a reservation. If you go for dinner, ask to sit with a view of the water. Big Dog Coffee- This little coffee shop is not only adorable (and very instagram-worthy), but they brew Intelligentsia coffee! Read full review here. Doce Taqueria- A hole in the wall right on Carson St., these tacos are AMAZING (and also super inexpensive). There is limited seating, so you can also take out, too! Mad Noodles- Absolutely delicious Thai, Chinese, and Japanese food. Very casual inside, great for takeout. I love the stir-fry beef, pad thai, Thai style fried rice, and more. You can't go wrong here- it is one of my go-to takeout spots! Little Tokyo- Aka. Little Tok. This would be where I would have my 'last meal'. I recommend fried rice with shrimp sauce, seaweed salad, discovery roll, spicy tuna roll and spicy salmon and avocado roll. Do not go to the one in the Southside. Mineo's- Best pizza in the city. Hands down, without a doubt. By the slice or a whole pie. Il Pizzaiolo- aka. Ill Pizz. One of my absolute favorites. Great wine bar, cutest outdoor patio, incredible Neapolitan pizzas and traditional Italian pasta. Danny's- The best Italian hoagie I've ever had. It's a hole in the wall, so take-out. Pho Kim 88- Amazing curry, but the best pad thai I've ever had. It's a hole in the wall, so I recommend take out. Aladdin's- Several locations. The best hummus ever. Also, great smoothies, hot tea, and salads. Pamela's- many locations, an iconic diner. Cash only. Get their crepe-like pancakes and potatoes. Sesame Inn- Best Chinese food. Silk Road- Another great Chinese restaurant. This has a really pretty atmosphere. Their Ma La beans are what I recommend. Beto's- A completely different kind of 'pizza'. Square cuts topped with cold shredded mozzarella. A hole in the wall, but you can sit and eat inside. I recommend doing so, so you can eat the slice right away before it gets warm. Hands down one of my favorite foods. Bistro 19- Really good filet. Cool atmosphere, too! Atria's- Their lobster bisque and greek salad are the reason I go. I also love the outdoor patio. Someone Else's Bar- Kitschy atmosphere but absolutely delicious wings. Carnegie Coffee Co.- The cutest coffee shop located in Carnegie. This post-office turned coffee shop has so much charm and plenty of cozy seating. Not to mention, they serve illy espresso! PaPa J's- Located in Carnegie, this Italian restaurant can't be beaten. A pretty Italian setting, and even better traditional Italian dishes. Great for date night. Block 292- A cute little market attached to an attractive restaurant with outdoor seating. The food is good (casual American fare), but the menu is limited. Jade Grill- Chinese and Japanese classics in a hip environment. Large bar area. Everything from sushi to noodles. Their noodles are homemade in-house and are SO good. I recommend the Lo Mein. Betsy's Ice Cream- Cute little ice cream parlor with classic flavors. The Pittsburgh pride flavor is my favorite! Vivo Kitchen- Pretty atmosphere, cute outdoor seating, great wine list and amazing food. Order the scallops. Mambo Italia- Pretty, unique atmosphere, incredible neopolitan pizza, BYOB. Andora- Amazing, large selection of entrees, cute outdoor seating, extensive wine and cocktail list. Bruneaux- The cutest atmosphere with an absolutely amazing brunch. It's one of my favorites in the city! Cucina Bella- Neopolitan pizza with bizarre but incredible toppings. My favorite is the one dusted with espresso grounds. It's also BYOB. Their basement has a wall entirely covered in wine bottles. Great for date night. Wild Rosemary- Make a reservation months in advance. Two seatings, very small and cozy. The menu always changes but is always incredible. Uncle Sam's- Super casual, the best buffalo chicken hoagie. Cash only. Point Brugges- Their brunch is amazing (be prepared to wait), plus their mussels and fries with fry sauce is to die for. Bangkok Balcony- You'd never know it was there as it is on the second floor above Levin Mattresses. A decent wine list and amazing pad thai. The atmosphere is more upscale than a typical Thai restaurant (but prices aren't expensive!). D's Six Pack and Dogs- Absolutely delicious hot dogs with so many topping choices. More than just hot dogs, though, there is a lot of different delicious bar food to choose from. In the back of the restaurant, you can make your own six pack with a great selection of beers. Great outdoor seating and dog-friendly! Monterey Pub- Fantastic Irish pub located in the heart of the Mexican War Streets. Inexpensive, and very casual, the food is fantastic and the atmosphere is loud and fun. Hyde Park- A regional chain, but one of my favorites. Their wedge salad can't be beaten! Bettis Grill- Standard bar food, but the atmosphere is great on game day. Also has outdoor seating! You're making me miss Pittsburgh so much. The steak phat wrap was always my go to at Fuel and Fuddle. I really want to try Six Penn Kitchen or Butcher & The Rye when I'm back in October for a Pitt game. I have SO many restaurants to try! I frequent the Lawrenceville area - Franktuary, Round Corner Cantina, and Industry Public House are my faves! I've always wanted to try Salt of the Earth as well, but it's closed for good now! I litttterally just sent you an email about this yesterday ;) BUT Atria's and Mineo's = MY FAVORITE PLACES in Mt. Lebo! Totally agree about the lobster bisque. Whenever you do these posts, you make me want to get to Pittsburgh ASAP - good thing I'll be there next month! Awesome list - will have to save if I ever visit Pittsburgh. This is such a great list; definitely bookmarking for when I visit! Pizza Taglio is a MUST visit!! Some of the best pizza in Pittsburgh! Let me just say, I spent the past hour looking up the restaurants in this guide, and I'm on the edge of my seat with anticipation! Of the restaurants in the Shadyside/East Liberty/Bloomfield area, which is the best for solo diners? I'm traveling to Pittsburgh alone next month! Again, great post! Altius is hands-down the best restaurant in Pittsburgh, IMO. To. Die. For. Monterey Bay was my previous favorite and is still 2nd on my list. I went to Morcillo last evening actually. It has gotten a lot of hype, but I was a little disappointed. It's good, but nothing had there was amazing where I feel like I need to go back and have more (lots and lots of tapas, we probably tried 1/2 the menu). The wine list is very small, but the cocktails were amazing. You MUST try Altius! The food is to die for and the service is impeccable. You'll love it!